Nearly all of us do at one time or other. The desire to fit in can exert a seemingly irresistible force. “Conform or be cast out,” Geddy Lee sings in the Rush song “Subdivisions.” The question is, how far will we go to do so? What will it cost us? And what happens if we fail? Perhaps more importantly, who sets the standard? Enter Rod Serling, and an episode of The Twilight Zone called “The Eye of the Beholder.” His 25-minute tour of a world where ugliness is a crime presents us with a terrifying specter: a society where peer pressure has been given the force of law, and conventional notions of beauty are turned on their head. 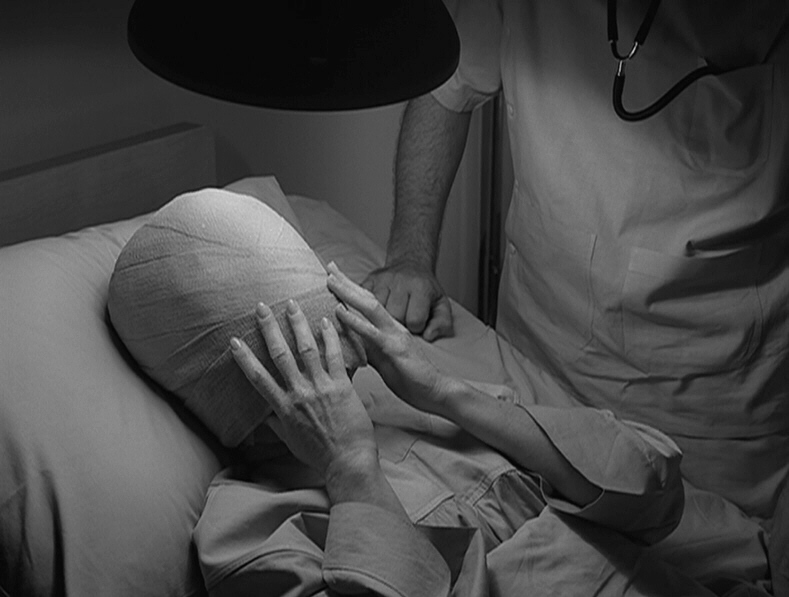 The story, in capsule form (here’s the last exit for those who have never seen the episode): Janet Tyler is in the hospital, her head encased in bandages, awaiting the results of a procedure intended to make her beautiful. But this is no elective plastic surgery. It’s a major operation mandated by law to help people deemed ugly blend in with society. When the bandages come off, the doctor and nurses recoil in horror from her … very attractive face. Only then do we see their faces, with distorted cheeks, twisted lips and pig-like noses. Now the questions that come to mind. Where is this place and when is it, what kind of world where ugliness is the norm and beauty the deviation from that norm? The answer is, it doesn’t make any difference. Because the old saying happens to be true. Beauty is in the eye of the beholder, in this year or a hundred years hence, on this planet or wherever there is human life, perhaps out among the stars. Beauty is in the eye of the beholder. Lesson to be learned … in the Twilight Zone. The famous unveiling scene is the episode’s centerpiece, but it’s remarkable how powerful the rest of the episode is, from first frame to last. I consider it the series’ finest, in fact. Everything clicks: the direction by TZ veteran Douglas Heyes; the acting by Maxine Stuart (Janet Tyler under the bandages), Donna Douglas (Tyler unwrapped), William D. Gordon (Dr. Bernardi) and others; the black-and-white photography by George Clemens; the soundtrack by Bernard Herrmann; the make-up by William Tuttle … and, of course, a script by Rod Serling that is both a pointed critique of a totalitarian society and a sensitive portrayal of a lonely woman. It’s pretty bad, isn’t it? I know it’s pretty bad. Ever since I can remember, ever since I was a little girl, people have turned away from me. The very first thing I can remember is a little child screaming when she looked at me. I never wanted to be beautiful. I never wanted to look like a painting. I never even wanted to be loved. I just wanted people not to scream when they looked at me. A face that belongs to a woman who just wants to smell the flowers and feel the night air. We naturally feel incensed that this gentle soul is condemned by a society determined to change her, exile her, or kill her. “Under certain circumstances, Miss Tyler, the state does provide for the extermination of undesirables,” Dr. Bernardi says in one of the most chilling lines of the entire episode. But this is unlikely, he says: “One of the alternatives … is simply to allow you to move into a special area in which people of your kind have been congregated.” Miss Tyler explodes: “People of my kind? Congregated? You mean segregated! You mean imprisoned, don’t you, Doctor? You’re talking about a ghetto, aren’t you? A ghetto designed for freaks!” Coming only a decade and a half after the end of World War II, this line is clearly designed to evoke the horror of the Nazi reign of terror. 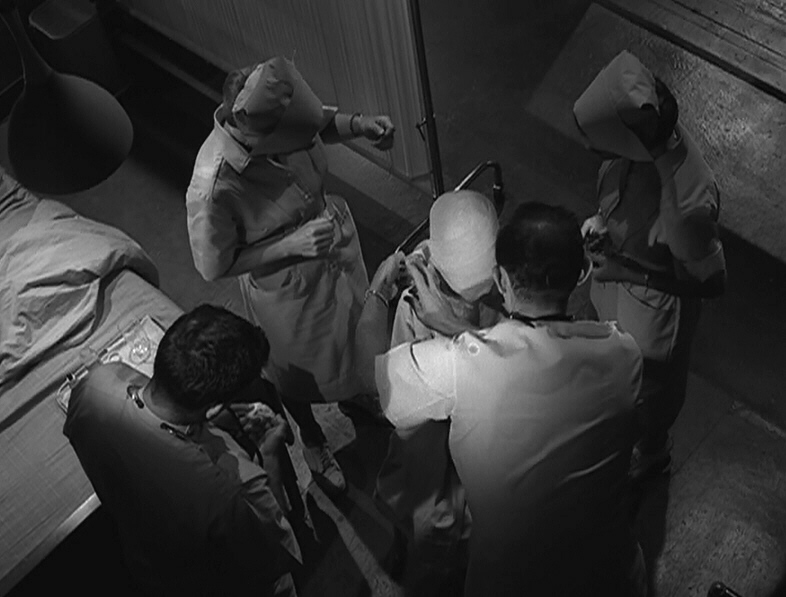 Douglas Heyes cleverly hides the faces of the doctor and nurses through adroit camera moves and heavily shadowed sets. We know something is up, yes, but what? Well, we know now that there must be a single purpose! A single norm! A single approach! A single entity of peoples! A single virtue! A single morality! A single frame of reference! A single philosophy of government! We cannot permit… we must not permit the encroaching sentimentality of a past age to weaken our resolve. We must cut out all that is different like a cancerous growth! It is essential in this society that we not only have a norm, but that we conform to that norm. Differences weaken us. Variations destroy us. An incredible permissiveness to deviation from this norm is what has ended nations and brought them to their knees. Conformity we must worship and hold sacred. Conformity is the key to survival. Survival? Perhaps. But to what purpose? To live a life in which you are merely an interchangeable cog in a vast wheel that allegedly represents progress? To be nothing more than an unhappy piece of someone else’s puzzle? To sacrifice everything that makes you different in order to please a society that views you as nothing but a faceless building block — one that will think nothing of discarding you if you stand out? That will change you, shun you or murder you for the unspeakable crime of being different? Who are you people anyway? What is this State? Who makes all these rules and conditions and statutes that people who are different have to stay away from the people who are normal? The State isn’t God, Doctor. The State is not God! It hasn’t the right to penalize somebody for an accident of birth! It hasn’t the right to make ugliness a crime! In fact, say it over and over to yourself. If we keep that thought alive, it might help us avoid one of the darker corners … of the Twilight Zone. Posted on 11/11/2012, in Rod Serling, Twilight Zone and tagged Eye of the Beholder, Rod Serling, Twilight Zone. Bookmark the permalink. 119 Comments. Excellent, in-depth post! I just watched this episode a few days ago. I didn’t think about the flat screen TVs everywhere being so…normal today. Whew – the State is not God, the State is not God. Seems like many in our State need to be reminded of that! Thanks, Mandy! “In-depth,” you say, and yet I felt as if I could have said a lot more! As it stands, this post is already significantly longer than any I’ve done before. But “Eye” is such a landmark episode, it more than justifies it, as far as I’m concerned. Question: Do you mean you just saw it for the first time, or that you saw it again? I haven’t rated this as one of my favorite episodes, but it IS one of the most powerful messages I can think of in the Twilight Zone “arsenal.” It speaks so much to “wanting” or “needing” to fit in. Needing to “just be you.” And who defines the public “anything,” anyway? But it also showed that at least someone in the “public norm” had enough heart to allow her to “just be her” with “others of her kind”—a better fate than extermination? Well, that would be for the individual to decide. Yes, Paul, a powerful episode and a powerful analysis on your part! Excellent job! And no, I’ve seen it several times, but I just watched it again the other day. It’s been awhile – streaming is allowing me to watch several I haven’t seen in quite a few years! I have given quite a bit of thought to writing a book, Mandy. You may well see it published one of these days! Thanks for the vote of confidence. Thanks, Larry. Yes, my copy of the Zicree book is well-thumbed! I appreciate the well-wishes. This piece is as surely a masterpiece as “Eye of the Beholder” itself. Mr. Serling couldn’t have written it better. You never fail to impress, Paul. Beautiful job. I remember the first time I watched this episode (many years ago) and how the unveiling of Donna’s face just floored me. It was so unexpected, such a shock, the whole idea of what we consider beautiful being portrayed as ugly was just such a foreign concept. 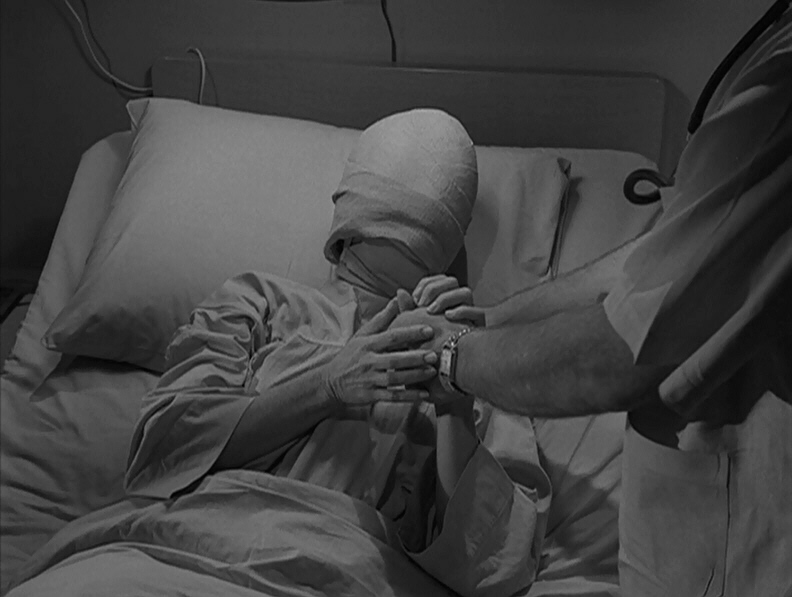 Of all the episodes of the Twilight Zone, this one truly is the embodiment of the show’s humanity. And your piece, as well as Serling’s script, has soul. Your conclusion truly moved me the way that Serling’s end narration did. No, the state is NOT God, and we would all do well to remember that. You’re a very talented writer, Paul, and your passion shines through this piece (and all your work) like the sun itself. I hope someday to see your name in print — on the cover of a best seller. And I don’t need the Mystic Seer to tell me that’s exactly what the future holds. Thank you so much for this glowing testimonial, Wendy. This episode, as you can tell, means a lot to me, so it’s very gratifying to know that I’ve conveyed my enthusiasm for it so well. It’s a “home run” for Serling, so I’m naturally pleased to think that my blog post is a fitting tribute to it. You’re right — this episode truly embodies the show’s humanity. That’s a major part of the reason why I rate it as my all-time favorite. The themes are so heartfelt, and the writing so lyrical, that it never fails to move me on a deep emotional level. In fact, I’ll confess that when I was re-watching the episode (yet again) to prepare myself to write this post, one scene brought a tear to my eye. It was when Janet Tyler tells the doctor how she never wanted to be beautiful — that she just wanted to not have people scream at the sight of her face. She leans forward, hugs his arm, and tears up. At that moment, I did too. My hope in writing this was to impart some of that feeling. I’m very heartened to think I may have succeeded. It’s a dream of mine to do so on a larger scale someday — in, yes, a book about TZ. When (not if) that happens, it will be because readers such as yourself were kind enough to encourage me. So thank you, Wendy. More than you know. Heck yeah, Paul, you should do a book! And Wendy can “art it up” and Mandy write the Foreword! Hey, I’ll do that for free! :) Foreword from a former Twitterer who just happened to stumble upon…The Night Gallery. Good to see you return. Did you get LOST in the Night Gallery? :-] Would be great to see a book, huh? Frank (do you go by Frank or prefer F.P.? ), if only Twitter had been half as interesting as getting lost in the Night Gallery! I abandoned social media (Twitter, Facebook, etc.) a month ago (exception: Pinterest), and although I don’t regret it at all, I realize my 6 months or so on Twitter had its purpose in my life – it introduced me to this blog (and yours) and all of you fine TZ people! Well, soc media has it’s “own way” about itself, and it can be maddening…not to mention time consuming. It’s hard for me to even try to tread its waters, but I’m a writer of fiction and this gets me “out there.” As you say, gets me to meet all kinds of COOL people like all of you! You have to find what suits you, Mandy! Take care, and hope you continue to check us all out…in the Twilight Zone (or Night Gallery)! 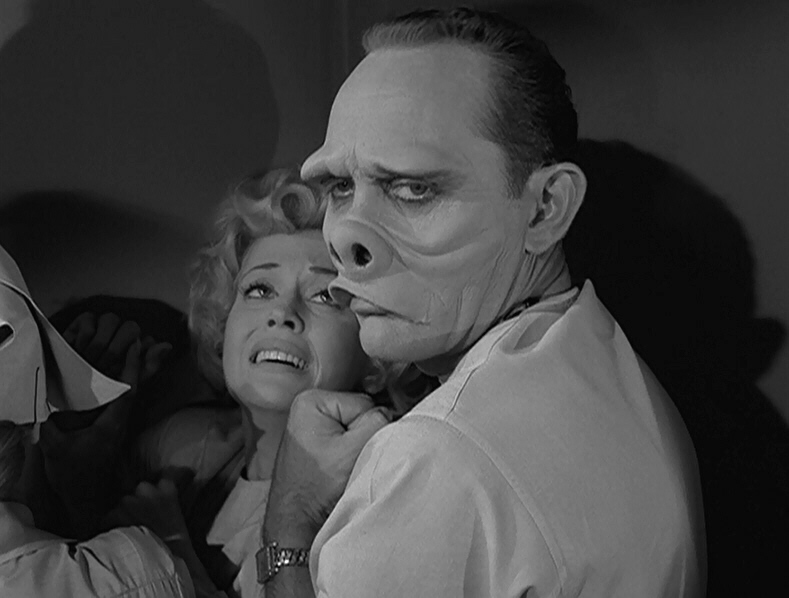 I love the Twilight Zone and will have to take a look at that episode. Maybe it’s on YouTube… I love it when a show makes you think. Thanks, Susie! Yes, it’s well-worth seeking out. I don’t think the whole thing is up on YouTube, but it’s available to stream on Neflix. It’s also on Amazon’s instant watch and on i-Tunes. And of course it’s on DVD and Blu-ray. Feel free to come back and leave a comment after you see it. Now I can’t get the tune out of my head. Not a complaint, mind you. This one and “Number 12 is just like you” make commentary on similar issues. If you can watch that one also, it’s worth it. One nice touch I recall from this ep is when the unwrapped heroine runs around a corner smack into the great-looking (to us) young guy who escorts her away. She screams and jumps back from him. “Number 12” is an excellent companion episode to this one, no question. Written by the incomparable Charles Beaumont. Sorry, conformity is mandated and deviation automatically stamped out. Good point. Yes, the double-speak aspect of “Number 12” does make it more troubling, in a way. Such a powerful and deeply human subject. I honestly loved your post and though I have never seen this episode, I now want to watch it for all it has to offer. I read things like this and wonder if I will ever be able to convey such powerful ideas into my stories. It is so easy to take for granted the time and effort it takes to create things that can touch the soul. Thank you! As a fellow writer, I know that feeling well. True creativity is all too rare. I love Rod Serling’s Twilight Zone. Also Night Gallery, The Outer Limits, and Tales From the Crypt which I feel were loyal to Serling’s O Henry aesthetic. Thanks for posting, loved being reminded of one of my favorites. You’re welcome, Sandra! Sounds like you have great taste in TV shows. It has a strong message. No question. More than one, in fact. Great analysis of one of my favored episodes. Reminds me of Hitchcock in the way that he makes the user’s imagination create the suspense and as you mentioned, viewers were caught off guard by the soft tones in their voices making it even more intriguing. I appreciate that, Mrs. P! Yes, there was a distinct Hitchcockian flavor to the story. Imagination is a key ingredient in any piece that relies on suspence, and “Eye of the Beholder” certainly does that. Thank you so much for this article. This helps me a lot, really. You’re welcome. Yes, it was a very pleasant surprise, set in motion by my best friend. Thanks! What a fantastic post, I really enjoyed reading it. I pride myself on my individuality, but I don’t really like being the center of attention, so it’s a tough one not to conform when you don’t feel strong enough to stand out. Thanks, I’m glad you liked it so much. Yes, it’s tough to resist, but I think ultimately we’re happier when we do. What a very interesting turn on the topic of uniformity and also beauty! One of the best posts ever, and congrats of your fresh pressing. What a nice compliment. Thank you very much! What a great blog … I found you on FP .. congratulations! I loved TZ when I was a kid and still do to this very day. Great post and I look forward to reading more. Thanks — I look forward to writing more! Always nice to meet a fellow TZ fan. Love this! Reminds me of ‘Invisible Monsters’ by Chuck Palahniuk – a must-read =D congrats on being freshly pressed! Thank you! Nice being compared to Palahniuk. Terrific post. I haven’t seen this, but I’d really like to. I remember seeing this spoofed on Saturday Night Live years ago. Pamela Anderson played Miss Tyler. Thanks! Yes, it’s well-worth checking out. And I remember that spoof — it was very funny. What great digital photos! Love this blog! One of my favorite series of all times. Really interesting movie summary/analysis. Thanks! Glad you liked it enough to reblog. 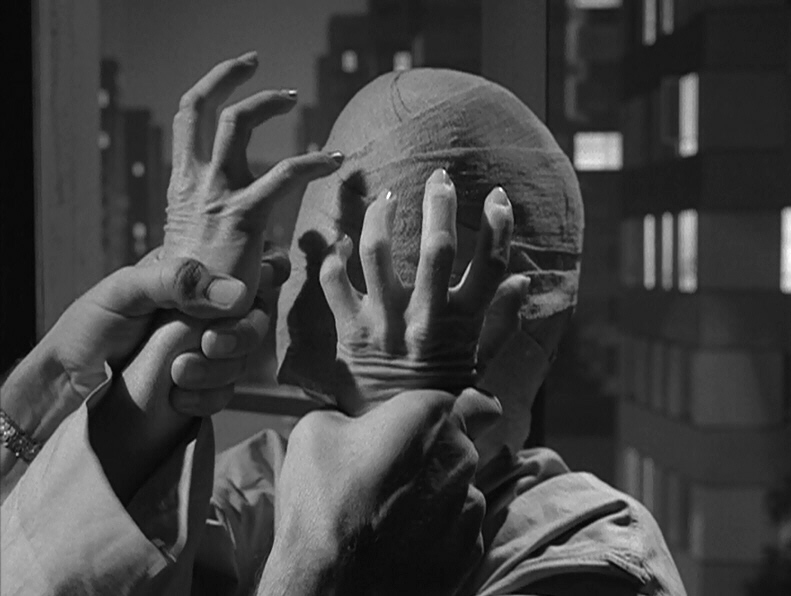 With all this talk about genetic engineering and the potential that ugliness could be lumped in with genetic deformities this TZ episode does not seem so far-fetched. Are we mature enough to not choose this path? I suppose time will tell. I know what you mean. Some of the classic TZ episodes seem almost like a premonition of the future. Indeed, they’re almost more relevant today than when they first aired. When I think of the Twilight Zone, I always think of two episodes. The episode where aliens came to eat us all and this one. Love the reminder and the truths you pointed out. Thanks! Yes, “To Serve Man” is also a very compelling episode. Very good. I am liking it. The State is not God. God is God, and He made you just the way you are. God doesn’t make mistakes; he makes originals, priceless in value. Are you a copy? Or are you an original? It’s your choice. I appreciate that, Tatiana. You make some very good points here. Thanks for sharing. My friend recommended that I read this, and I’m glad I did. It’s hard to get rid of the ideas that are implanted in our minds, but I think breaking free of them is important to every individual so we can see to the truth of things. Thanks! To you and your friend. It’s a struggle, as you say, but certainly worth the effort. I’ve watched this episode many times, and even though now when I watch it, it still hits me with a multitude of emotions. Rod Serling showed his genius and insight when writing the episodes for the Twilight Zone, especially in this one. You’re right — this episode showcases so much of what made Serling a top-notch writer. It’s a clinic, really, in how to make an important point in a dramatically interesting, compelling and entertaining way. The State is not God… it is more real than that. Art has no place for passive resignation to social mores and folkways. Yes. Not all art is meant to challenge, but it’s important that some of it do just that. I think that episode can’t only be about ugliness. It’s about racism, sexism, and ethnicity. There are several important themes at work, no question. It was my hope to explore those themes, in fact, that led me to write this post. “Leader’s on tonight.” The nurses in this episode were great. Yes, the entire cast was stellar! Thanks! I like your blog. Just “subscribed,” in fact. Much appreciated! It’s “Elly May,” but we’re more interested in her here as Janet Tyler, of course. And yes, what a great dramatic performance she gave. Glad you enjoyed the post! Thank you for a tremendous post! What an eloquent summary of this spectacular work. What really got to me when I just now watched it again was when Miss Tyler says to Walter Smith, “Why do we have to look like this?” It really hit me, the seeming omnipotence (as in God!) of societal norms that judge who is and isn’t acceptable. The State is not God – and neither is anything or anybody else. Yet we continue to create and worship our own gods, and punish those who do not conform to their/our precepts. Thank God for honest thinkers like Serling who I hope can keep us from the tyranny of our own making. 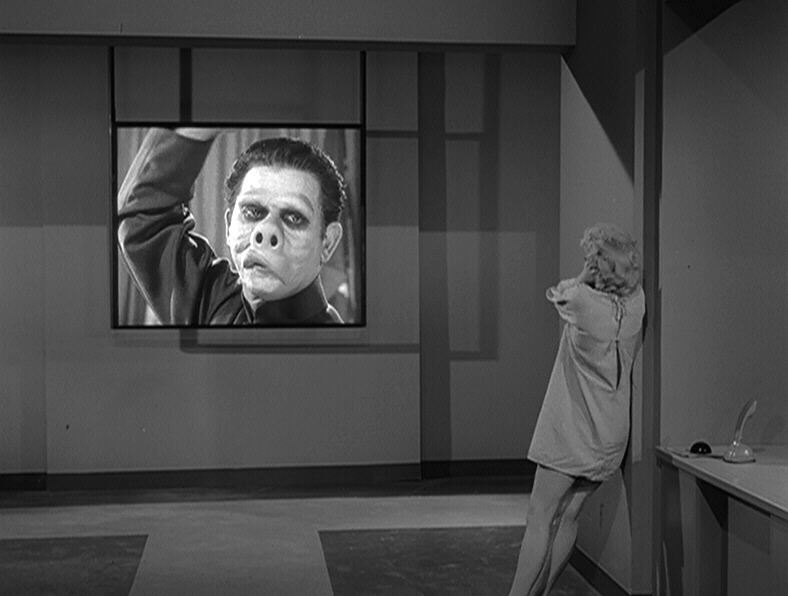 Rod Serling was a master storyteller, and “Eye of the Beholder” is definitely one of Twilight Zone’s best offerings. Glad I stumbled across your blog today. Looking forward to future posts, Paul! This story reminds me of the Night Gallery episode “The Different Ones”(1972) in which a horrendously ugly(by our own standards that is) young man finally finds true happiness(and hopefully lasting love) when he is sent away to a far off planet where, surprise surprise, all others are like him! A pointed critique of ANY society(be it the Soviet Union or apartheid era South Africa- or the segregated Deep South of the Jim Crow era) that enforces intelliectual and physical conformity!